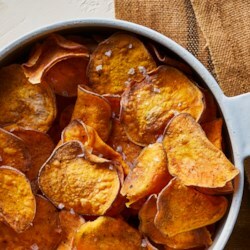 1 Place sweet potato slices in a large bowl of cold water; soak for 20 minutes. Drain and pat dry with paper towels. 2 Return the sweet potatoes to the dried bowl. Add oil, salt and pepper; toss gently to coat. 3 Lightly coat air-fryer basket with cooking spray. Place just enough of the sweet potatoes in the basket to form a single layer. Cook at 350°F until cooked through and crispy, about 15 minutes, flipping and rearranging into a single layer every 5 minutes. Using tongs, carefully remove the chips from the air fryer to a plate. Repeat with the remaining sweet potatoes. 4 Let the chips cool for 5 minutes; serve immediately or cool completely and store in an airtight plastic container for up to 3 days.